It is often believed that jumpsuits don’t flatter short girls. If you have heard this too, then delete that thought from your mind right away, because there are 15 fabulous jumpsuits for short height that will look stellar on you! If there is one thing about jumpsuits that you had wrong, then its the fact that they don’t look great on short girls. Our recommendation of jumpsuits for short women will have you adding them to your shopping cart right away! With a deep V-neck and slim pants, this jumpsuit has all the features that will make one look slender and taller. If there is any jumpsuit for short height that you ought to get, then it’s this one! Price: Rs 2,799. Buy it here! Big bold prints may not be your BFF if you fall on the shorter side, but sweet polka dots sure are. This skirt style polka-dotted jumpsuit is casual yet chic. Wear it with wedges or platforms and it will make the perfect jumpsuit for short height girl! Price: Rs 1,599. Buy it here! 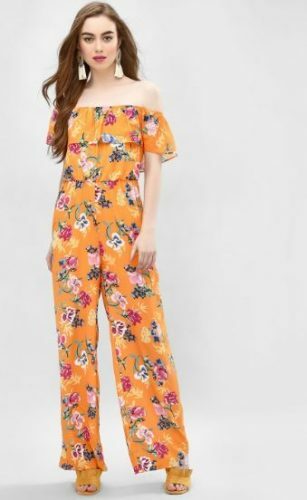 This floral jumpsuit is perfect for girls who are not into solid colours. The colours aren’t that overwhelming and the side slits make this one the best option for girls who want to add a few inches to their frame. 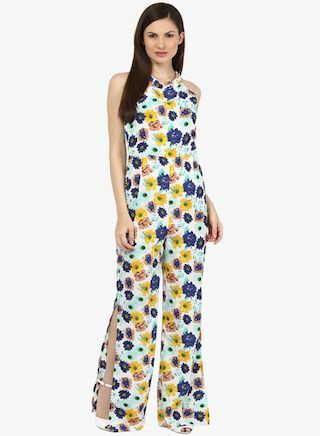 So don’t forget to consider this jumpsuit for short heights if flowers are your thing! Price: Rs 1,499. Buy it here! Off-shoulders are the hottest thing right now and this jumpsuit nails that trend. The slight high waist cinch and the ruffled top make this one such a perfect jumpsuit for short girl! Price: Rs 2,699. Buy it here! Denim can do no wrong if you’re looking for a jumpsuit for short height. This quirky denim jumpsuit with the V neckline is sure to make you stand tall and look totally fabulous! Price: Rs 3,299. Buy it here! Perfect for a formal look, we have totally fixated on this navy blue jumpsuit. The pants have been cut a little above the waist and this silhouette elongates your legs and makes you appear taller. 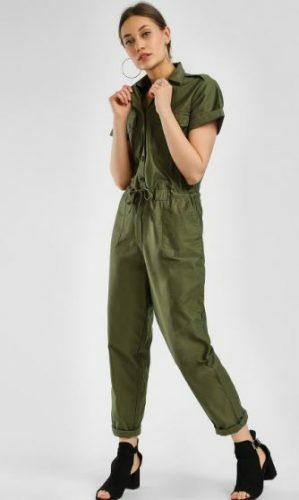 The perfect jumpsuit for short height girl, you possibly can’t go wrong with it! Price: Rs 2,999. Buy it here! Dare to go all out and don the all-white jumpsuit just because you can. The cut-out and lace details on the shoulders and the waist are to die for, thus making it an appropriate jumpsuit for short height. Price: Rs 1,019. Buy it here! 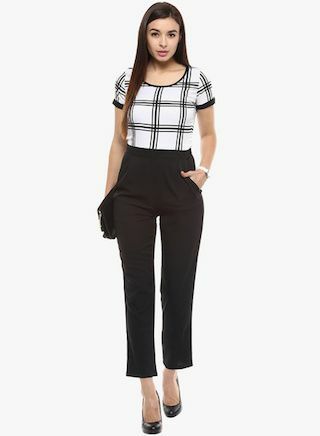 If you want to wear cropped jumpsuits, then this number is the best choice for you. The vertical patterns work effortlessly to create an illusion of a longer body. And all those colours make it the perfectly appropriate jumpsuit for short height girl. Price: Rs 1,699. Buy it here! 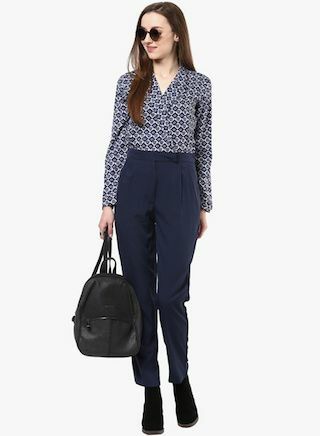 This versatile jumpsuit for short height is perfect for casual outings or office wear. Wear it with flats or steep pumps, you just can’t go wrong with this one! Price: Rs 2,199. Buy it here! How absolutely gorgeous is the V neckline on this jumpsuit? Accessorize this one with small ear studs and your favourite black heels! This one is an absolutely adorable jumpsuit for short person! Price: Rs 1,899. Buy it here! There is something badass about this colour that has even the best of us in love. Pair it with pumps or pointy heels, this is an all-powerful look and a jumpsuit for short height that won’t ever fail to do justice to its wearer! Price: Rs 1,999. Buy it here! The best thing about animal prints is that anyone can pull them off beautifully, no matter the height! So if you’re looking for a jumpsuit for short girl, this is one of your best bets! Price: Rs 1,999. Buy it here! We believe that you hardly ever can go wrong with reds, which is why this body-hugging jumpsuit is perfect for anyone worried about being short by a few inches. Plus, the heels that you’re gonna pair it with will more than makeup for your height! Price: Rs 1,899. Buy it here! Who says that western and Indian cannot cross over, for this jumpsuit is that and so much more! The easy-going look that this jumpsuit provides will be perfect for every short girl out there! Price: Rs 3,499. Buy it here! We mean it when we promise you that you never have to worry about style with us, for this jumpsuit for short height is not only flattering to your body but is ultra glamorous as well! Pair it with high heels and an awesome hairdo and you’re ready to rock the dance floor! Price: Rs 2,899. Buy it here! Don’t stray too far if you’re worried about how to wear a jumpsuit if you’re short. Our jumpsuit styling tips will have you looking and feeling confident in no time! Wearing a well-fitted jumpsuit will give you an illusion of having a taller height, and will also give you a long and lean silhouette. Just like any other piece of clothing, oversized jumpsuits don’t look too great on short women. Not only will they give them a bulky appearance, but they will also make them look like they’re walking in someone else’s clothes! When styling your jumpsuit, do make sure that you pay special attention to your waistline. Make sure that your jumpsuit highlights your waist since this would give your figure some form. Likewise, do make sure that you highlight your waist with a belt if your jumpsuit doesn’t have a waist cinch. As a general rule, do make sure that you stick to solids, particularly those in darker hues. This will give your look an illusion of taller height and would definitely flatter your form. While prints are great too, do make sure that you stick to vertical patterns as they will look best on you! Since jumpsuits cover a large area of your body, the rise of the jumpsuit can essentially make or break your entire look. So do make sure that you pick out jumpsuits that have a higher rise as they would do more justice to your overall frame! Now that you know everything about styling a jumpsuit, go ahead and get yourself some that flatter you in the best manner! Also Read All You Need To Know About Wearing Jumpsuit Featured Image: Shutterstock A place where girls can talk about ANYTHING. (No guys allowed!) ?? Get the POPxo app NOW on Play Store and iOS App Store.